West Coast midfielder Andrew Gaff threw an unprovoked off-the-ball punch at Brayshaw in the third quarter of the Eagles' 21.16 (142) to 13.6 (84) win on Sunday. Brayshaw, who dropped to the turf with blood pouring out of his mouth, feared that some of his teeth had been knocked loose by the punch before later confirming that he had broken his jaw and split his lip. Footage of the shocking punch went viral on social media with Twitter users slamming the act as "disgraceful" and "disturbing". Irrespective of whether he feels remorse or not Andrew Gaff should get 8 weeks and be charged with assault inflicting grevious bodily harm. Gaff, who is teammates with Brayshaw's brother Hamish, publicly apologised over the incident after the game and said he "felt sick". "I just want to apologise to Andy. 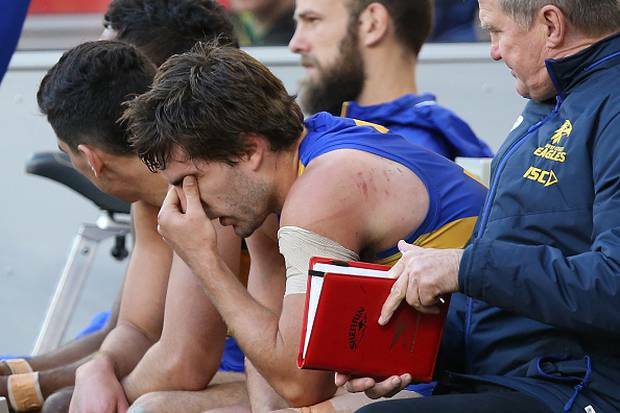 I feel sick about it," Gaff told Fox Footy. "I did the wrong thing. I like to think it doesn't indicate my character and all that but my main thought is how he is. I'm very remorseful and I feel sick about it." "It's hard to say what happened. My only thought is how Andy is. It is what it is and what will happen will happen." Despite Gaff's remorse, Fremantle head coach Ross Lyon went on the attack for Brayshaw and said his senior players wanted to settle the score with their own hands after the incident. "I've got an 18-year-old kid that I saw in a real mess when I came down to the rooms and his mum in tears as I was walking in. It's not very palatable," Lyon said. "It was very distressing. He was pretty distraught. I gave him a hug. It was hard to keep the emotion back yourself when you see his mum. I wouldn't like to see my son like that." "My senior players certainly wanted retribution. I had to stay out on the ground longer at three-quarter-time to calm them down and say don't bring yourself into disrepute." Gaff was allowed to play out the match after sitting on the bench late in the third quarter but could face a lengthy stint on the sidelines with some viewers predicting a five-week ban from the game.